21 Mar 2019 --- The chances of consumers opting for healthier and more sustainable canteen meals rise significantly when those meals are labeled with a traffic light system. This is according to a Queen Mary University of London study, published in the journal Appetite. The study also found that people tend to choose “greener” meals over “healthier” ones. The researchers note that the traffic light system “works intuitively for most people,” underlining the idea that such a labeling system could spark a shift towards more positive nutritional and environmental habits. The traffic light system labels food according to the content of fat, sugar and salt it contains, with red meaning a high or unhealthy level of these ingredients. The research simulated a lunchtime canteen set up to examine choices made when given different options. Colors such as red, amber and green were used to indicate how environmentally-friendly and how healthy the meal options actually were. The idea behind the study was that when people would notice the traffic lights associated with the food options they would opt for the more sustainable and healthy ones, say the researchers. Previous studies have shown that traffic light systems influence consumer choices when it comes to individual products, but this new study examined how they may impact nutritional choices in a simulated lunchtime environment, where people have to make entire meal choices. This kind of behavioral intervention designed to improve day-to-day decisions in real time is commonly known as a “nudge.” Another novel aspect of the study is that it compared the relative impact of traffic lights, as nudges, to support positive changes in behavior when the traffic lights indicated healthy eating or when they indicated environmental consciousness. Click to EnlargeThe findings highlighted that positive changes towards better overall choices were boosted by the addition of more information on what the traffic light labeling meant. For example, the levels of carbon emissions required for the production of each meal or their caloric content in relation to the daily recommended intake. 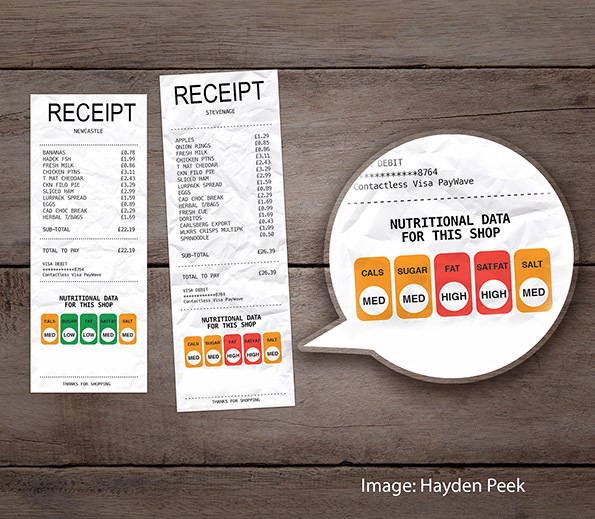 “We show that using traffic light labels on menus influences the meals people choose, and so this simple technique could easily be implemented on menus in bars, cafes, restaurants as well as canteens, to indicate to people the greenness as well as the healthiness of food items,” says lead author Dr. Magda Osman of the study from Queen Mary University of London. “In addition, and more importantly, the findings show that the persuasive effects are boosted by general information about daily calorie intakes and acceptable levels of carbon emissions associated with meals,” she notes. This means, that while traffic light nudges are intuitive to understand, people need additional information to interpret more precisely what the different colors of traffic lights actually refer to, according to Osman. The study involved seeing pictures of meals available during lunch that participants could choose from where the range of meals were more or less healthy, and more or less environmentally-friendly. The experiment compared meal choices when no traffic lights were present, and then when they were present, and it looked at the changes in meal choices based on the presence of those traffic lights. Although presenting two traffic lights, one indicating “greener” meals and the other indicating “healthier” meals, at the same time might overload the consumer, the researchers found that presenting both compared to just one actually boosted the positive effect on consumer meal choices. “Given the current social policy interests in persuading people to make choices that mean we eat more sustainably, which means eating less red meat, less of depleted fish stocks, less dairy, and move towards eating more vegetables, then studies like this help to show what methods could be used to inform people about sustainable meal options in a clear and intuitive manner,” Osman concludes. Food labeling is increasingly coming to the fore as it makes for an impactful method to influence consumers towards making better choices. In this space, KIND Healthy Snacks (KIND), backed by several health and nutrition experts, recently filed a citizen petition to prompt the US Food & Drug Administration (FDA) to amend its nutrient content claims regulation. 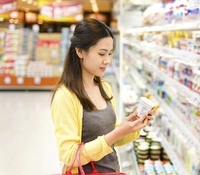 The existing regulation notes the quantity of a nutrient added to a product, instead of the product’s overall quality, which could lead to consumers purchasing products that may be perceived as healthy, when actually they are not. KIND has also requested that the agency allow nutrient content claims on items that contain a “meaningful amount of healthy ingredients,” such as vegetables and whole grains.